In 1887, when the trustees of Tifereth Israel bought the land for Mayfield Cemetery, Cleveland's Jews lived between East 9th and East 55th streets. The cemetery was about a mile east of the city limits which were near East 110th Street, and up a steep hill - Mayfield Road. But it was next to 200-acre Lake View Cemetery, the final resting place of Cleveland's elite, and on a state road. They chose well. MapQuest map. It is owned by United Jewish Cemeteries, which is jointly owned by Cleveland's oldest Reform Congregations: Anshe Chesed Fairmount Temple and The Temple - Tifereth Israel. In this Google Satellite View ® north is at the top, east at the right. Mayfield Road, which runs east-north-east, is in the lower right. Coventry Road, which runs north-south, is at the right. A chapel and a building for the office and caretaker were soon constructed. A mausoleum was added in 1930 and enlarged in 1970. Rabbi Abba Hillel Silver's gravesite is in the southwest (lower left) corner, marked on this image by a small gold circle. The grave of Moses Alsbacher is in section 4. In 1887 Tifereth Israel (today The Temple - Tifereth Israel) was on Huron Road and East 6th and their cemetery was only a half acre west of the Cuyahoga River, next to the Anshe Chesed's Willet Street Cemetery. But a trend as old as Cleveland - the better-established residents moving east to newer housing - was accelerating as immigrants poured in to the low cost housing in the old Lower Woodland neighborhoods. Tifereth Israel would soon buy land for a new synagogue on Willson Avenue (East 55th). Looking far ahead, they bought more than 22 acres of land for a cemetery on Mayfield Road, a mile beyond the city's eastern border. 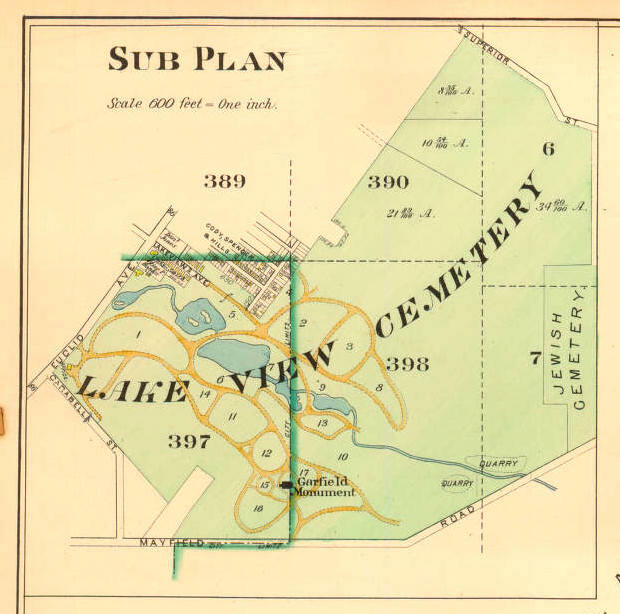 We show below a segment of an 1898 map of East Cleveland Township, showing Lake View Cemetery and a "Jewish Cemetery" section, where Mayfield Cemetery is today. 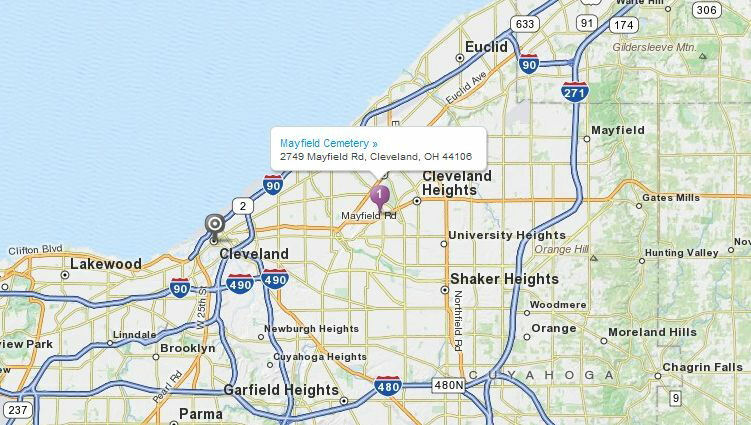 The map wrongly suggests that Mayfield Cemetery was a section of Lake View. Mayfield Cemetery's property does abut Lake View and it gives the appearance of being part of Lake View. But from the start, Mayfield Cemetery was always a separate entity. Why the need for more burial space? In 1886 Tifereth Israel had only 128 families. Each death is recorded in the congregations minutes, as are burial fees. With the congregation losing perhaps 10 persons a year, why the need for so much more space? The Jewish community was growing older and the older generation would have been thinking in terms of family plots. Families then were large. Simson and Regina Thurman had ten children; the norm was perhaps four or five children. Thus, it would be the sale of family plots that created the demand. Members would not have wanted burial in a Jewish cemetery and not one of the small cemeteries owned by Orthodox congregations. A careful reading of the minutes of Tifereth Israel show these steps. More land is purchased adjacent to the Willet Street Cemetery for $600. At a special meeting of the Tifereth Israel trustees a resolution to buy 20 acres of land at $300 an acre is passed by a vote of 25 to 1. Jacob Mandelbaum buys the 20.649 acre parcel from Sarah and Daniel Doty. 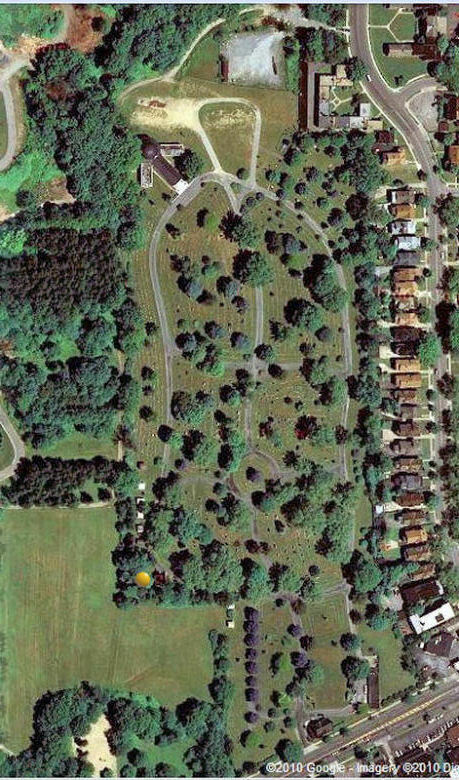 The price of $300 an acre seems high for that location, but the size of the property, its location on a state road (now Mayfield Road) and its being adjacent to 200-acre Lake View Cemetery, where Cleveland's leading non-Jewish families are buying plots, made it very desirable. An 1873 map of Cleveland shows a streetcar line on Euclid Avenue (it ran on Prospect Avenue until East 40th to avoid the street of mansions (Millionaire's Row), all the way to Lakeview Avenue. Jacob Mandelbaum and his wife (wives were often included in deeds to resolve any claims of dower right) sold the land to Tifereth Israel for exactly what they had paid. The first burial, Samuel Bloch, age 36. The two Reform congregations vote to merge their cemeteries, forming United Jewish Cemeteries. This joint control continues today. The chapel, an octagonal stone structure seating 200 persons is dedicated. See the Mayfield Cemetery deeds. For more, see our page on United Jewish Cemeteries. 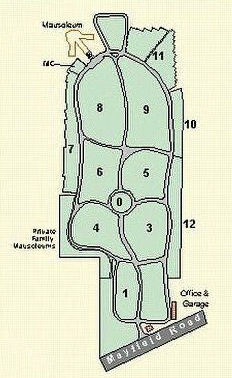 As Mayfield Cemetery was developed, some families reinterred their relatives there from Willet Street Cemetery. 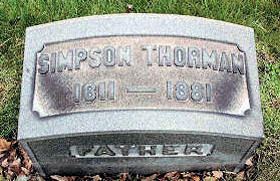 One example: Cleveland's first Jewish settler Simpson Thorman. In addition to the regular streetcar service up Mayfield Road, for many years a special funeral streetcar would bring mourners and the casket up Mayfield Road to the cemeteries and after the funeral, take the mourners back to town. Originally open to all Jews, Mayfield Cemetery would change its rules in 1928. Following a custom often practiced in older congregations in Cleveland and elsewhere, burials would now be limited to members in good standing of these two Reform congregations. Why this restriction and why in 1928? In 1890 the two congregations had a total membership of less than 400 families. But the great wave of immigration (1880-1924) would cause Cleveland's Jewish population to soar - from 3,500 in 1880 to 85,000 in 1925. Many new congregations, first Orthodox, then Conservative, would form. Yet for 97 years (1851 - 1947) no new Reform congregations would be started! With some immigrants and so many of their children joining Reform congregations, by the mid-1920s Silver's (Tifereth Israel) and Brickner's (Anshe Chesed) as many called them - were among the nation's largest, with a combined membership of more than 4,000 families. While in the early years the cemetery would have been seen as more space than they would ever need, by 1928 it is understandable that the congregations would conclude that it was not large enough to accommodate nonmembers. Further, this policy also means that members who resign or do not pay their dues cannot be buried in their old family plots. This first version of this web page, with the 1898 map (above) showing Mayfield Cemetery within Lake View Cemetery and finding no deeds in 1887 - 1890 for Tifereth Israel or United Jewish Cemeteries, stated that Mayfield Cemetery had bought the right to use the section for burials, but did not own the land. (Such arrangements are found when congregation takes control of a section of a larger cemetery.) We invited Pat Corrigan, the director of Mayfield Cemetery, to review the page. He replied that we had it wrong: the land was owned by United Jewish Cemeteries and not by Lake View Cemetery. When he said "Look for Jacob Mandelbaum." we soon found the deeds and corrected our error. Thank you Pat.